One side affect of the rain after a long drought is that the flowers and trees are going berserk with their pollen. 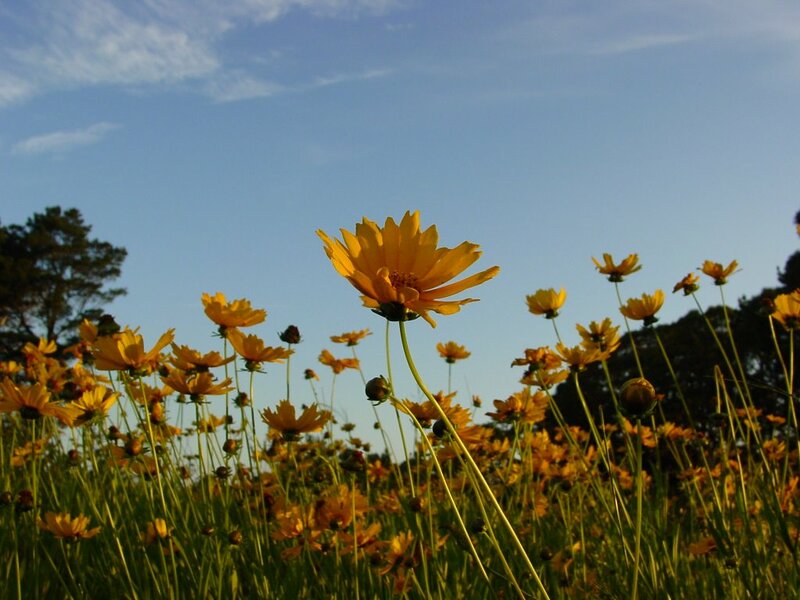 Hayfever is rampant, even amongst those who don't normally get any symptoms. In our area grows this flower. We don't know what it is, but it was introduced about 60 or so years ago and spread like a weed. It probably is. 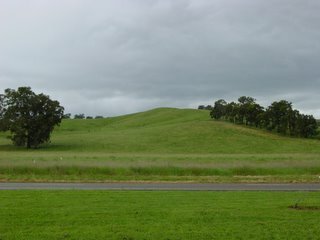 But it is mostly within a 15km radius from here, along roadsides and unkept paddocks and fields. It's very pretty but it's pollen really affects anyone susceptible to hayfever and Lana is just waiting for them to die off once Summer takes hold. 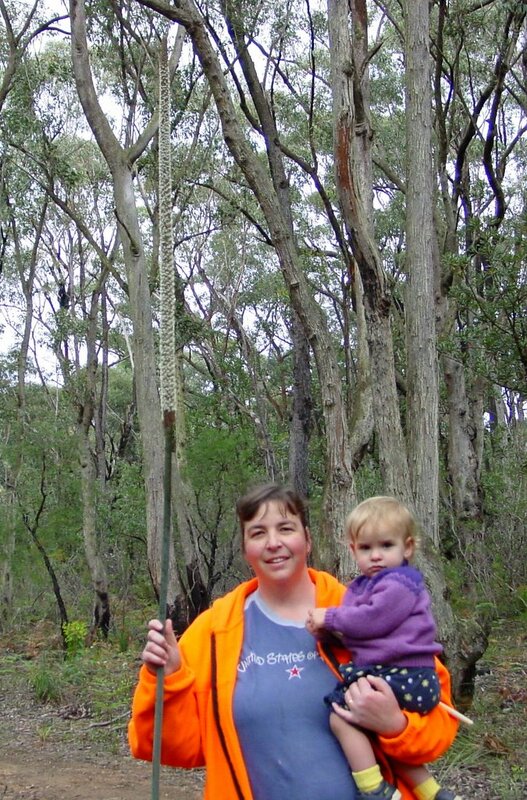 There are lots of uniques plants in Australia and this is one of them: Xanthorrhoea or "Black Boy"
It is called a "Black Boy" because it looks like a spear in the air with an Aboriginal boy hiding in the bush. 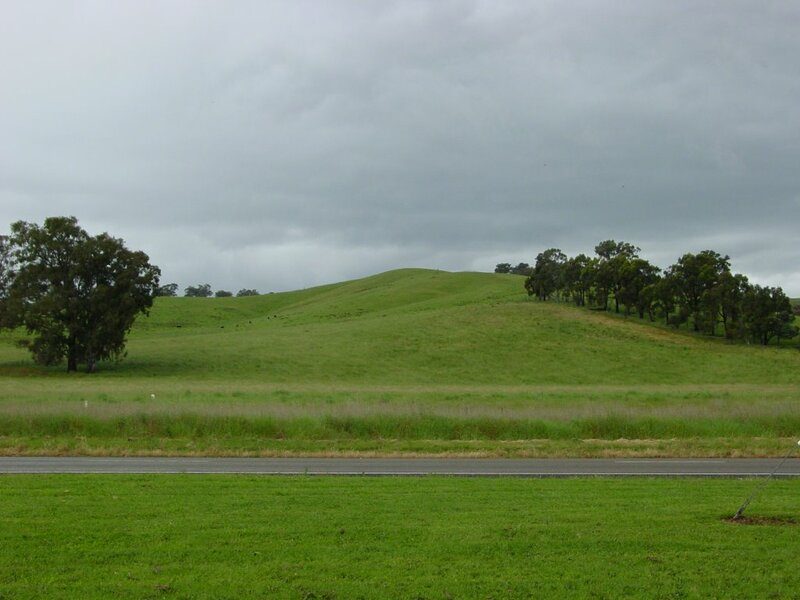 The plants are also knows as "balga grass" which is the Aboriginal word for black boy. As you can see from this photo, the stem can grow quite tall. You will probably have to click the photo to see the details as the stem blends in very well with the trees in the background. 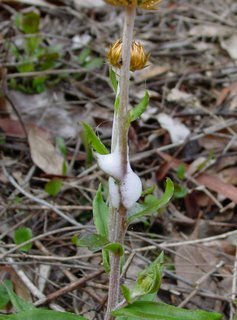 This stem is in flower. After flowering the top is black. The boys have found that the stem when dried makes a great spear or jousting stick, being long, light and relatively straight. Should we build another water tank? We have had so much rain that even with lots of baths and showers all our tanks are overflowing. 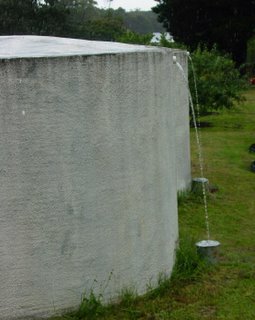 The children put buckets at the bottom so the water goes out of the tank and overflows the buckets! This means they can play in the water without wasting any. At one time they had a huge array of gutters and buckets leading water all over the place from the overflow. Hmmm. How can we tap this water? 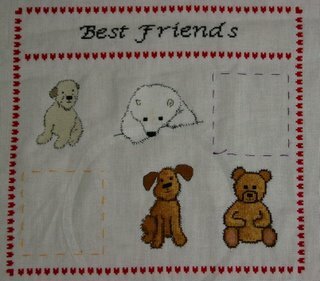 This is another of Lana's free cross stitch patterns. This pattern is from Passione Ricamo, an Italian site with many beautiful patterns, including many nice ladies. However, I think this has the last tree incorrectly. It shows the Winter topiary with snow and Christmas tinsel and baubles, but we all know that Christmas is in the middle of a hot Summer. The time when family and friends gather round cold meats, cold drinks and lovely desserts with Summer fruits - and always with the risk of those in the volunteer fire brigade having to rush off and fight bush fires. This is the latest stage of the stitch-a-long Lana is stitching. The newest part is the shaggy dog which looks a bit like Gromit from Wallace and Gromit - but shaggier. Now Lana needs to wait for the next part. 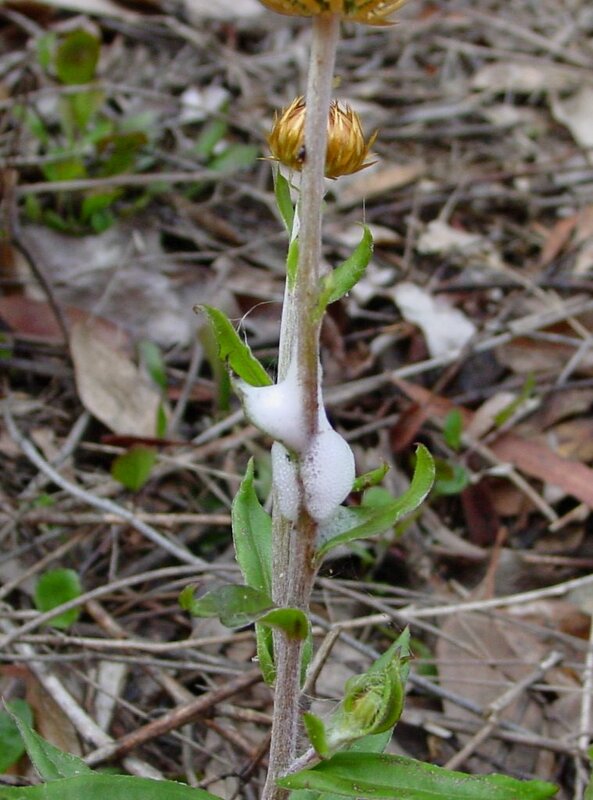 The tell tale sign of a spittle bug is what looks like spittle on the stem of a plant. Lana and the children discovered this one on one of their recent walks. The foam is very like spittle. Ariel knew what it was, remembering it from her science books. It uses the spttle to keep itself cool. If you wipe the spittle bug clean, and watch it long enough, you can see it create more spittle. Another fascinating one of God's creatures. There was an advertising campaign recently for vacations to the priesthood entitled "Men in Black" with a picture a various priests in their distinctive black gear with white collars. The priests of the Order of St Paul the First Hermit have white habits. 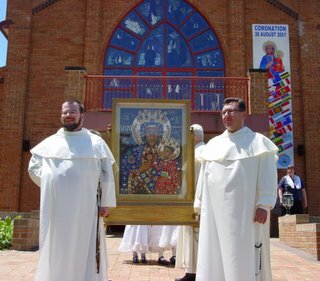 Here are two of the priests getting ready for the procession with the replica of the image of Our Lady of Jasna Gora. Behind the image you can see the feet of Clare and her friend in their position. Pop John Paul died in April this year. 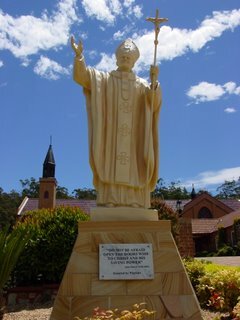 He often visited the Monastery of Jasna Gora in Poland, and in memory of this very good man the local monastery erected a statue in his memory. The statue is life sized and is quite impressive. Here is Clare and her friend looking very pretty in their white dresses. The monastery often has special events in which the girls get the opportunity to dress up and participate in a procession in which the priests, brothers, altar servers and everyone else walks along behind. On the 13th day of each month Our Lady of Fatima is remembered and the procession goes from the church to the grotto, a special area containing many various sites containing remembrances of different saints. These sites ("shrines") assist the faithful remember those who have gone before us in the faith and are now with God in heaven. Yesterday we attended the Feast of Our Lady of Mercy at the nearby Monastery run by the Order of St Paul the First Hermit. 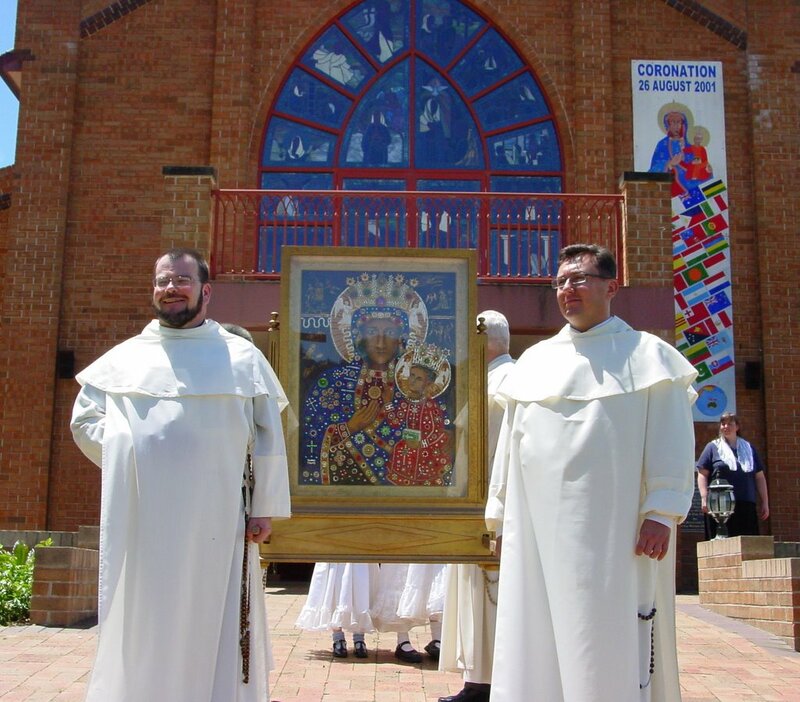 The monastery has a replica of the miraculous image of Our Lady which has a fascinating history. 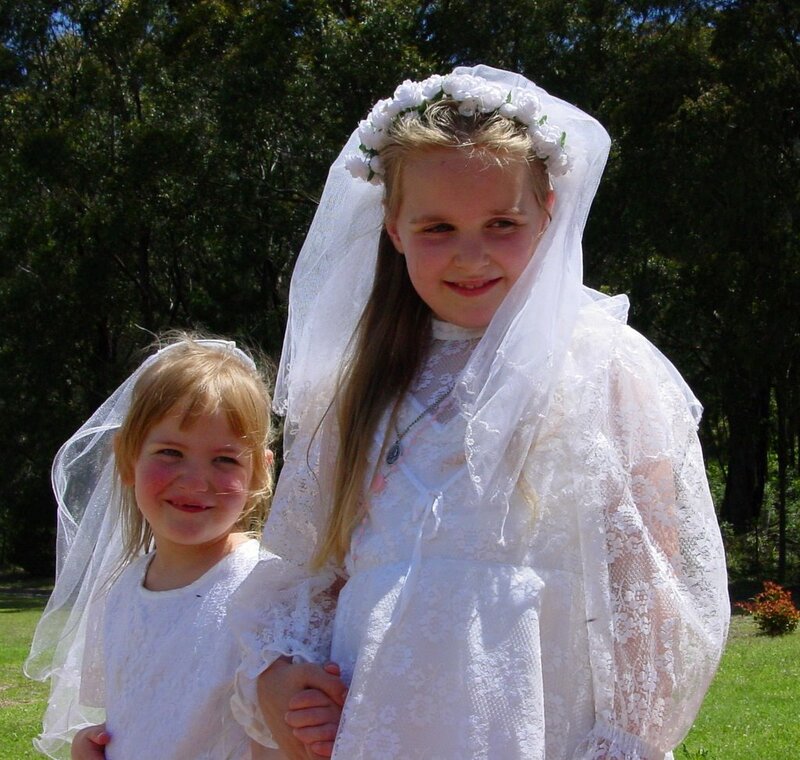 As part of the Mass, Clare and one of her homeschooling friends were dressed in white dresses and small veils (see next post) and assisted in bringing up the offertory gifts. Clare took this role very seriously and walked up the aisle VERY slowly. Waiting patiently was the Bishop, James and the prior of the Monastery. You can tell from the Bishop's expression that they are watching the progress very carefully. In the background is one of the Brothers of the monastery wondering what is taking so long. James is doing his job standing patiently. 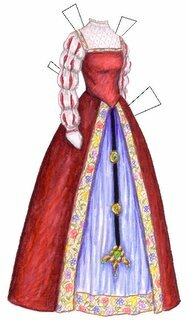 I did a Google search for Paper Dolls and found some really cool Paper Doll Sites. One of them is a Paper Doll Blog and for every posting she has a paper doll costume or doll that she draws herself. The picture --> is one that she drew. Marilee's Paperdolls page is a site that has links to other sites as well as her own. To save the pictures, right click and select "Save as" to put it in a folder on your computer for later printing. I have a Paper Dolls folder with a lot of paper doll pictures. Clare often wants me to print some for her. If Dad won't let me print in colour because it costs too much, we print on the laser printer and colour them in ourselves. Melissa Wiley is the author of The Martha Years books about Laura Ingalls Wilder's great-grandmother, Martha Morse Tucker, and The Charlotte Years books, about Laura's grandmother, Charlotte Tucker Quiner. Melissa and her husband Scott also homeschool and she has posted a very good article about her reasons why. I have added her blog to the other homeschooling family blogs on the left hand sidebar. Whilst staying at my client's home I noticed their very busy garden. The garden included a Lemonade Tree. This is a cross between a lemon and a mandarin and is sweet like the lemonade we were able to enjoy in the US. It peels like a mandarin and tastes delightful. This is an Australian developed hybrid and gives fruit all year round. I was able to collect a couple of dozen to the delight of the boys when I returned last night. Our garden is starting to grow and I think we will find a lemonade tree to add to our collection of fruit trees. Yum. 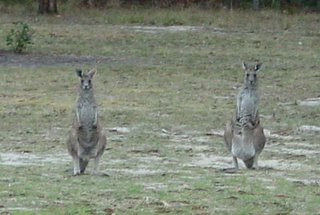 When we were in the US many people asked us whether we saw many Kangaroos. We replied that we often did. These two were at the local monastery and were part of a mob of kangaroos that live locally. 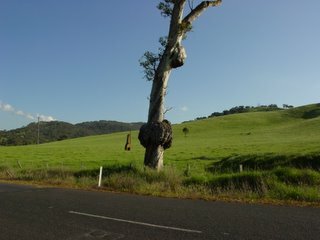 Whenever you drive in Australian country near dawn or dusk you need to be careful as this is when they travel the most. We did comment that we don't see them in town going down the middle of the road, just in the country areas. Well, we were slightly wrong. On Monday Lana was in the local town dropping our van off for a service and returning home via the suburban streets. A kangaroo hopped out of someone's front yard and jumped right in the middle of the road. Lana travelled slowly behind him until he finally hopped up the next road and between some houses. He was obviously used to people as he wasn't in any particular hurry to get out of the way. Sunday was the regular monthly homeschoolers meeting at the nearby monastery. This time it was extra special as Peter made his First Holy Communion. 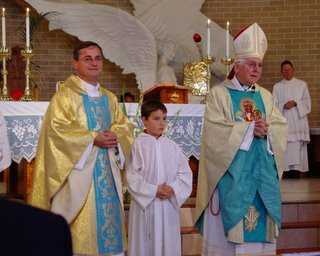 He has been ready for this for the last 18 months but was unable due to the bureaucracy in the local diocese in the US. Once we returned we spoke to the parish priest who knew Peter and immediately we arranged the day. Peter wanted to wear the bow tie for the special event. We wanted to also dress up in a white shirt and jacket but we don't have a lot of extra clothes after our return. One of the homeschooling mums arranged the organ and a choir of young homeschool ladies to sing and we had a collection of great hymns which everyone sang proudly. There were two priests, two brothers and six altar boys. A special kneeler was set aside for Peter to receive the Host and throughout Mass Peter kept telling us, "Soon! ", "It's getting closer." and at the consecration, 'It's VERY close". Aftwerwards you can see how happy he was standing next to Father. 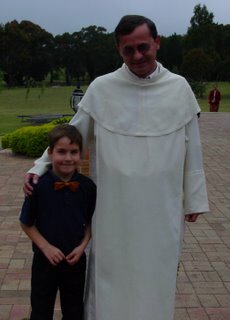 We then spent some time with all the families at the monastery and then went to another friends place where two other boys had their First Communion too. With five families and 27 children we all had a marvellous time, not returning home until after 10:00pm. The children are maturing and beginning to contemplate life, the universe and everything. This is one of the best parts of homeschooling - we are there to discuss the issues. One child made the comment that large families couldn't have some stuff. Space, things for themselves, and so on. Well, I replied, everything you do in life is a result of choices you make. Where you are today is a direct result of the decisions you made along the way to here. Some of them may be from a long time ago and some from today, but you always have to make choices and live by those consequences. Worrying about what might have been is silly - as the choices you make mean that "what might have been" may never really have been an option anyway. I then compared what we had as a large family that smaller families didn't have. Children and siblings that make you laugh, others with whom to share your life and joys and sorrows, the ability to share and do without. The child mentioned that the "share and do without" part was a bad thing. I suggested that it wasn't. If one grows up getting everything he wants, eventually he will be in a situation where he has to make a choice. Too many people make the wrong decision in that situation and go into debt or do other stupid things because they can't discern between a need and a want and don't know how to say no to themselves. Families give the best training in sharing and making choices. Real pro choice! Always choose Good over Evil. To thine own self be true. I also explained that not everyone can have large families, but all successful families try to impart the same values of sharing, love and strength of character on all their members. Yes. This is one of the reasons why we homeschool. So our children can discuss these issues with people that love them and want them to be all God wants them to be. Walmart - It was really handy having a place where you could buy almost anything for a low price. Vidalia Onions - Sweet onions that don't make the eyes water and make great onion rings. Grape Nuts - a breakfast cereal we referred to as "Gravel". It was a great addition to our home made muesli. Amazon - purchasing from Amazon and other US online sellers was very convenient and at good prices. Sam's Club/Costco - Bulk purchase warehouses. Similar places here are limited to businesses (which I can get around) but they aren't as convenient. Breakfast Sausage - Savoury Mince. We have substituted by making our own with the butcher. Library - The selection of books at the local Library was great! Sweetened Coconut - Despite my complaints about coconut being 1/3rd sugar, it was nice in Muesli. Pocket Knives - In NSW it is illegal for anyone under 16 to carry a knife. In the US children as young as five and six had pocket knives. Less Flies - but that is OK. We'll trade flies that don't bite for all those chiggers, gnats, hornets and wasps any day! Hampton Inn - US hotel chains typically allow children to stay for free and only charge per room and have free breakfast. Here they charge per person and with 6 extra people the extra charge is higher than the base room rate. And that is without any breakfast. Seasons - It was nice knowing the season by looking out the window. Bright Green = Spring, medium Green and Hot = Summer, Red/orange/yellow = Fall (Autumn) and Grey/white and cold = Winter. Update: We just went shopping again. Another thing we need to somehow replicate is Seasoned Salt (without the MSG). It is a key component in a number of tasty recipes we brought back with us. Backlog of posts to come ... done! We finally made our way back home. 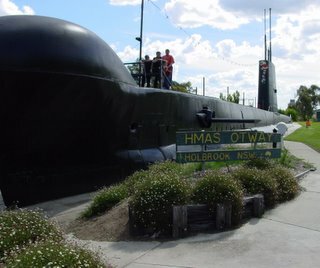 On the way we stopped in Holbrook, NSW so the children could play on the submarine. If you look at a map you will discover that Holbrook is NOWHERE near any body of water that can take a submarine. This site tells the amazing story. It is a full sized submarine (90 metres/100 yards long) which can be climbed upon and clambered over. It is a good spot to stop and have a rest. So there you go. A busy few days. We arrived at the Church at 9:45am. People were already arriving. By the time 10:30 came around, the Church was overflowing with friends and family praying for the soul of the deceased and showing their support for his family. There were thirteen priests con-celebrating the Mass and showing their support and probably over 500 people worshipping in the congregation. Considering that most of the attendees travelled between one and five hours to attend this is a good display of the esteem in which the deceased was held. We knew him from the homeschooling camps we attended. He was a school teacher and at the camps he always organised the softball game where everyone - young and old - had a go. Afterwards we travlled to the cemetery about 30 minutes away. In the South of the US a funeral procession drives quite slowly with all cars showing their headlights. No cars overtake them and cars travelling in the opposite direction pull over as a sign of respect for the departed. We travelled up to 100/110 km per hour trying to keep up with the car in front who we hoped knew the location of the cemetery. After the burial and final prayers for the faithfully departed we joined in the food and drinks in the hall. The children were sent outside to play to make room for the adults. We were able to catch up with many of our homeschooling friends and take the opportunity to reflect on life and death and the last four things. After leaving the party at 2:30pm we had to get to Shepparton before 5:00pm. The Ardmona SPC Factory sells lots of their "seconds" and damaged goods for great prices. As it is all tinned and long term storage food it is perfect for a pantry. We arrived at 4:30pm and rushed through getting lots of tinned tomato, tomato paste and tinned fruit of all kinds. Pears were really cheap with 2.9kg (6.38lbs) tins of diced pears selling for $1.00 ($0.75 US). The van was quite heavy after our purchases! 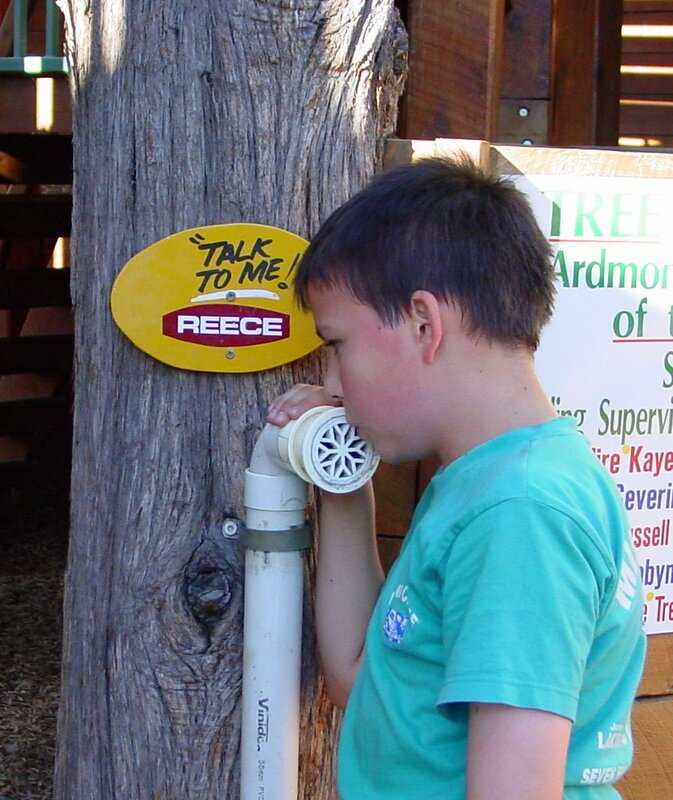 Nearby is the Ardmona Kids Town, between Mooroopna and Shepparton. It is a HUGE playground. 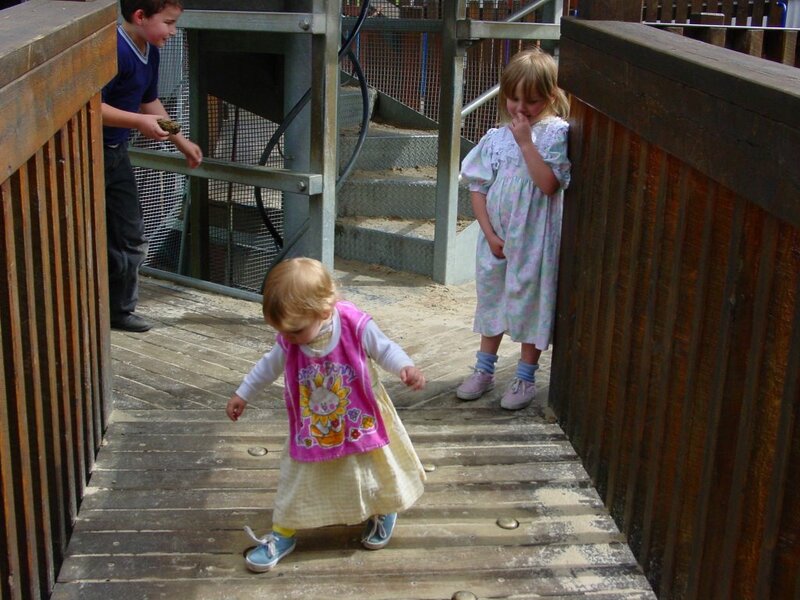 Mazes, slides of varying sizes, climbing frames, and everything for kids big and small. 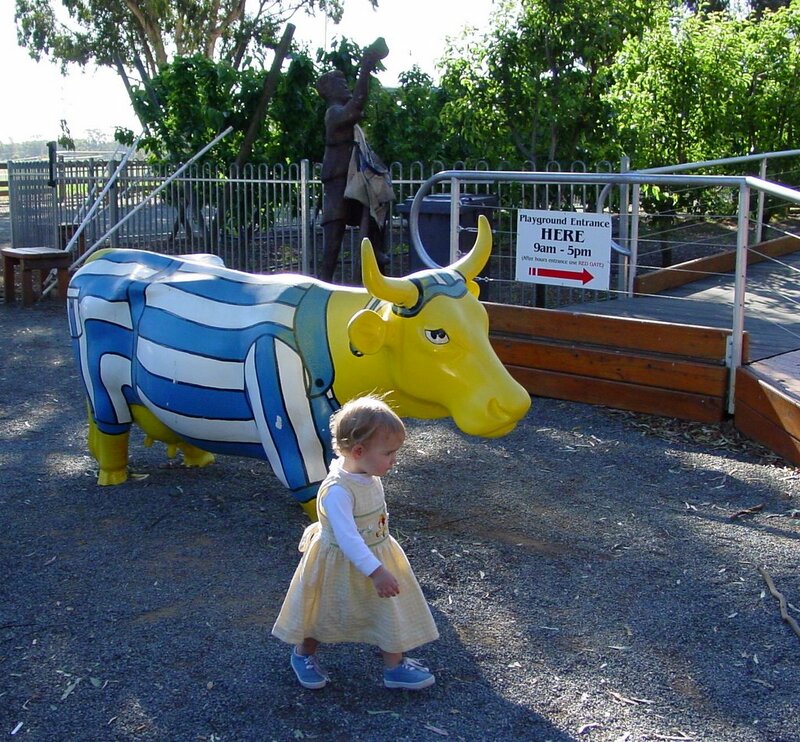 This photo show Rose walking past a painted Cow statue. Painted cows are all over Mooroopna and Shepparton and are sponsored by local business in an annual competition called "Mooving Art". They are painted in all sorts of costumes and the children enjoyed discovering cows in all sorts of places. The park also has lots of these "Talk to me" points. These lead to other points. The aim is for one child to talk into one end whilst the others search the rest of the construction for the other end. Then it is the next child's turn. The pipes go in all directions and children clamber everywhere. After the park we travelled along a mixture of sealed and unsealed roads until we arrived at our homeschooling friends' home for dinner and their company. We would be travelling with them to the funeral on Monday. We started Sunday by getting everyone up and out promptly so as not to do any inadvertent damage in a non child friendly place. After a breakfast of lovely fresh custard buns we went to Ruffey Lake Park which we knew had a great playground. There were swings, slides, poles and climbing frames, forts and bridges and lots of sand. Here Rose is enjoying stomping on the bells which are placed along the bridge, with Clare waiting for her turn and James running behind playing a game of "Siege" with the others. This was to get them some exercise before we went to my father's birthday party. The party went well with all my brothers and sisters. My youngest sister announced the beginning of the 13th grandchild so everyone was excited. The sad news was that we had to leave early and make our way to Albury for a funeral. One of our homeschooling friends died last Thursday. He was the father of eight children and well loved by many. So we moved things around to get there in time for the funeral on Monday. Central station in Melbourne is built on the site of an old Shot factory. The tower is encased in a huge glass and steel cone and surrounded by a multi level shopping complex, with the train station below. 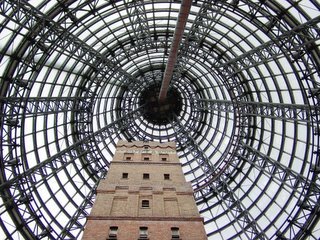 This is a view from the base of the shot tower. My family were amazed we somehow fit into my sister's one bedroom unit. My sister and her husband stayed elsewhere overnight so we could stay there. Lana, Rose and I were in the bed, Ariel and Eric shared a mattress on the floor in the bedroom, Clare and Peter slept on the double seat lounge, and we joined the two single lounges for James. No worries! Plenty of room. Despite Clare's dismissive memory of Melbourne there were lots of things to see and experience. 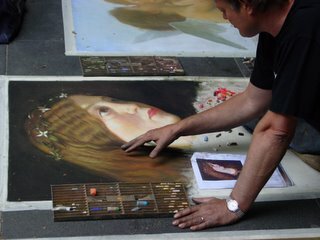 There were a number of street performers (buskers) and chalk artists. This fellow taped down a piece of canvas and then "painted" with chalk a number of classic pictures. If you click on the photo you will get more detail. He did an amazing job. 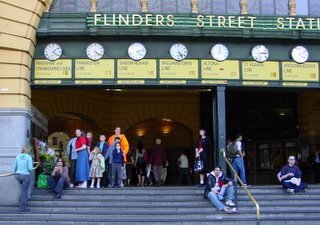 Bells are ringing from weddings taking place in the Anglican (Episcopalian) and Catholic Cathedrals, music coming from wandering players, bells dinging from trams (trolleys) as they toodle down the streets. 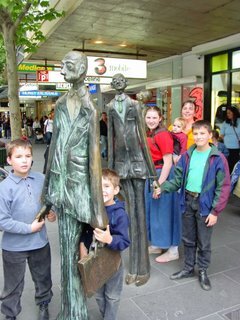 There are a number of interesting statues in various places, including these caricatured people in poses as if waiting for the tram. Many busy passengers in too much of a rush to pay attention have been embarrassed when they discovered the chap who wouldn't move was actually a statue! After we attended Vigil Mass we went to see the traditional Myer's Christmas Window display. 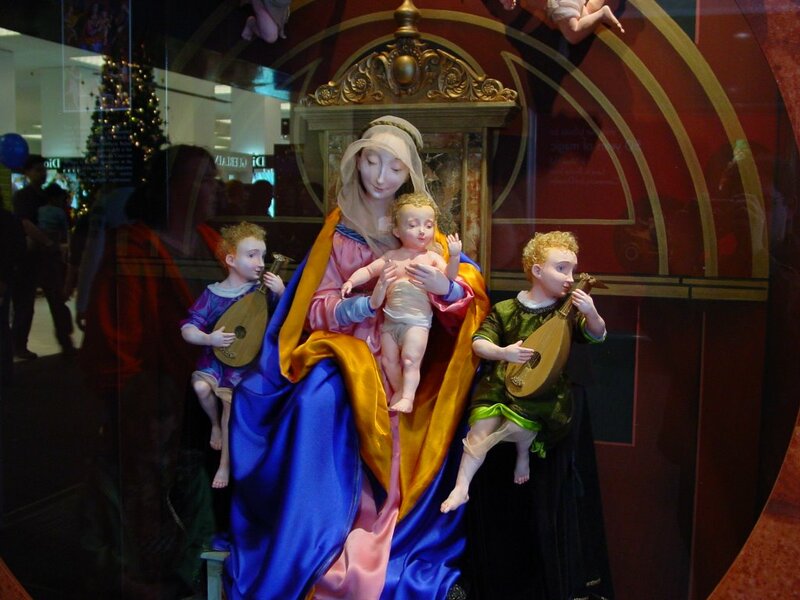 Over many years the Myer department store in Melbourne used all its windows to show a Christmas story. Recently the stories have become more and more stupid such as this year's. The Santa Kid. A businessman arrives at the North Pole and announces he has bought out Christmas and is introducing new efficient work practices. Santa Claus stays in bed and gives up. His daughter objects but doesn't do much other than complain until the delivery trucks break down and she uses the sleigh to deliver presents. The nasty businessman gives up on the enterprise, Santa gets out of bed and we are told the Christmas spirit isn't about presents after all - it's all about believing. "Believing in what?" was my question. The businessman believed in his project enough to risk his time and money, Santa believed that his time was now over so in the end everyone must be OK. What a stupid book! No positive adult role models, all children can save the world despite the nasty adults and morals that can mean anything. Bah! Humbug! Happily, Myer does allow one token Christmas display. This one is based on a famous piece of art of Mary and Jesus. We then wandered around looking for something nice to eat. I did notice that a family of eight stands out a bit on a Saturday night in the city. On Saturday we went down to Melbourne to visit family and show them how we have changed over the last few years and display our latest addition. We stayed at my sister's little unit and caught the train into the city. This allowed the children to experience train travel and see the city. 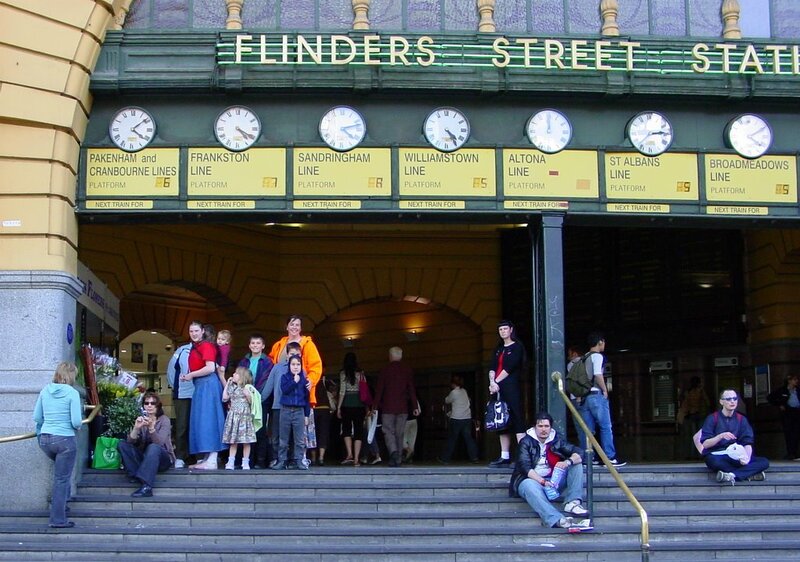 A traditional meeting place for Melbournians is the Flinders Street Station clocks. So here we are. And with Lana's bright orange hunting jacket we are easy to spot. "We got on the train. Then we got off. We climbed up stairs and down stairs. And I lighted a candle at church." "Is that it?" I asked. "Yes." she nodded. 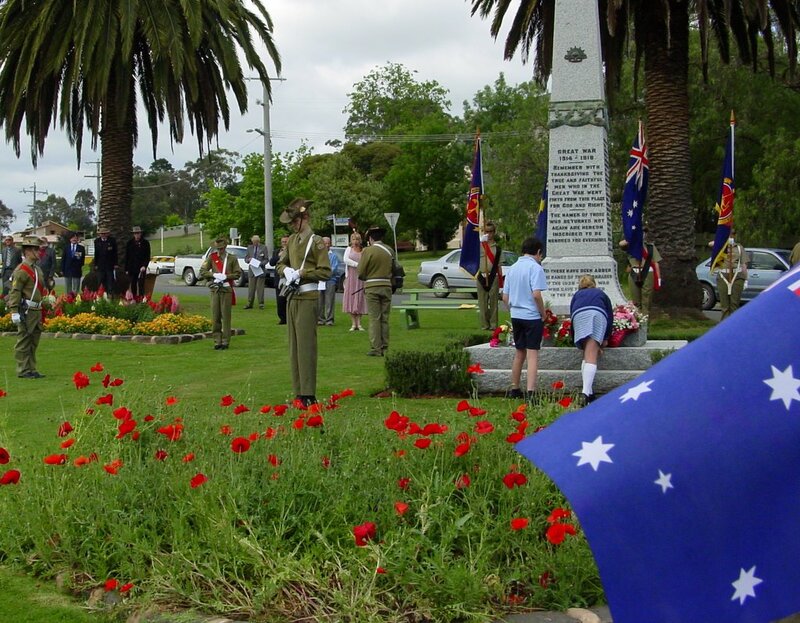 Lana and the children found themselves in Yea on Friday and attended the ceremony at the War Memorial. Soldiers stood guard whilst children laid some flowers and speeches were made. Memorials like this one are in most towns across Australia and are primarily from World War I with additions made after World War II. In World War I approximately half of all eligible men enlisted - voluntarily. The casualty rate was over 60%, with 15% of those enlisting dying. This cut a great swath across all walks of life in Australia and affected every town and city. from this place for God and Right. to be remembered for evermore. lives in the same cause. More statistics can be found at www.anzacday.org.au. Last time I was here the drought was pretty bad. I took this photo from the same spot last time - compare the colour! There has been lots of rain in many parts of Australia which has eased the pain in many areas. However some parts of the country are still in drought, up to 10 years in some parts. Some of the major cities are still on water restrictions, with each more severe restriction level getting labelled as Stage 1, Stage 2, etc. This site details some of the official nature and penalties of the restrictions, and this is Victoria's Water situation. On the first day I was dropped off at the client's and Lana and the children went fishing at one of the local fish hatcheries. Actually, you could probably call it "catching" rather than fishing, but it is fishing without all that boring waiting time. I reckon if you fell in you would come out with fish in all your pockets. They did the bulk of the fishing in the middle sized fish pond. Then Lana decided they would try the "banquet" size fish pond. 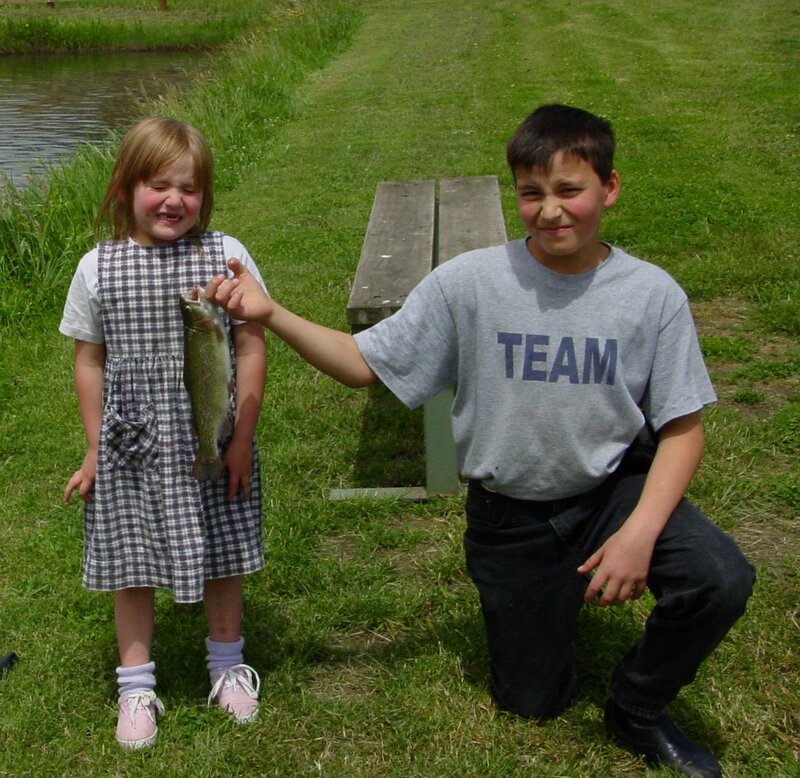 The first fish they caught was a little one and so was the second. Some banquet! The hatchery didn't charge us for them they were so small. Clare even had a go, but as you can tell from her expression, there was no way she was going to touch the fish to show us what she caught. We paid for the fish we caught and this provided dinner for the next two nights. Lana had prepared for this by bringing down some garlic, butter, lemon and alfoil (aluminum foil). The fish had already been cleaned at the hatchery, so all we had to do was put garlic and butter in the middle and some butter, garlic and lemon slices on the top, wrap in foil, and cook for five minutes on each side. Combined with some yummy chips (similar to steak fries in the US) from the local fish and chip shop and we had a lovely meal. Lana wanted some nice cockatoo feathers so I was under instruction to stop when I saw one on the side of the road. This instruction I dutifully obeyed when I spotted this cockatoo on a back road somewhere in country Victoria. Lana and Ariel then went to see if they could get some nice feathers. Unbeknownst to them I was taking some shots through the windscreen (windshield for my US visitors). She finally spotted me and gave me the pointing finger. Unfortunately there weren't too many undamaged feathers. I needed to visit one of my clients in country Victoria, so we made the trip into a family vacation. Whilst I was at work helping make my client's business systems work better, Lana and the children explored the surrounding area. We did this before I left and I was able to negotiate a pretty good deal for accomodation in the nearby town of Alexandra at the same place we had stayed previously. After attending Mass at the local Monastery we left around Midday. We travelled with various stops and finally arrived about 8:00pm. At the bottom of the left hand margin is a list of visitors by country. A nifty geography lesson can be learned by hovering your mouse pointer above the flag and the country's world location will be shown. 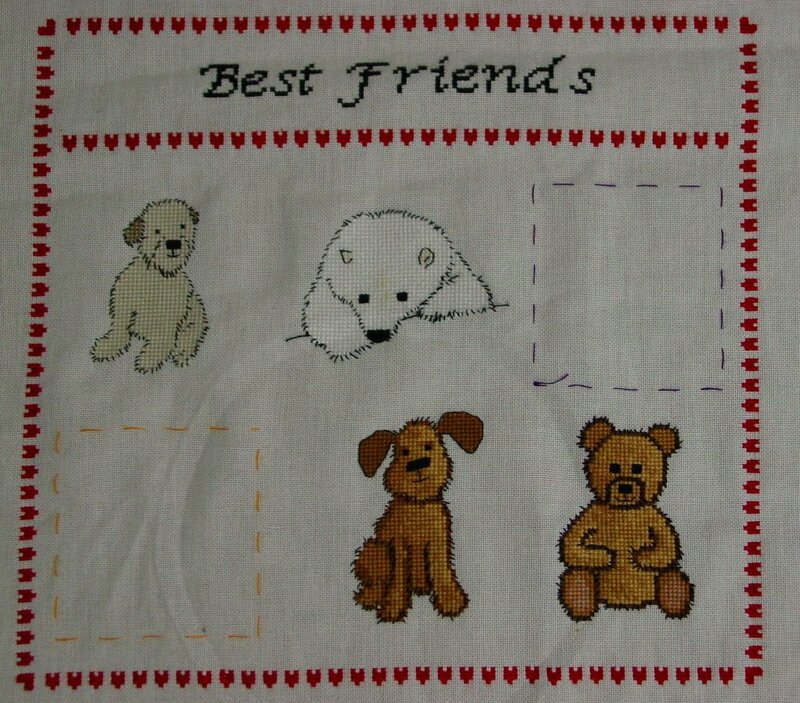 Many of our visitors come from people we have met in person in Australia and the US as well as electronic contacts on Lana's cross stitch boards and our homeschooling groups. Others discover us via a Google, Yahoo or MSN searches. So far people from 40 countries have visited. When we lived in Sydney and didn't care how much water we used, our monthly usage was about 10,000 litres per month. Last night we received over one and a half month's water supply! Our water tank capacity is about 90,000 litres (23,195 gallons), so we should be able to live for nine months with no rain. As Lana's dad remarked, "It's times like these we could get another water tank"
The girls were testing their dresses. To see whether a dress works one must check how it spins. The other night when I asked, "For what did God make us? 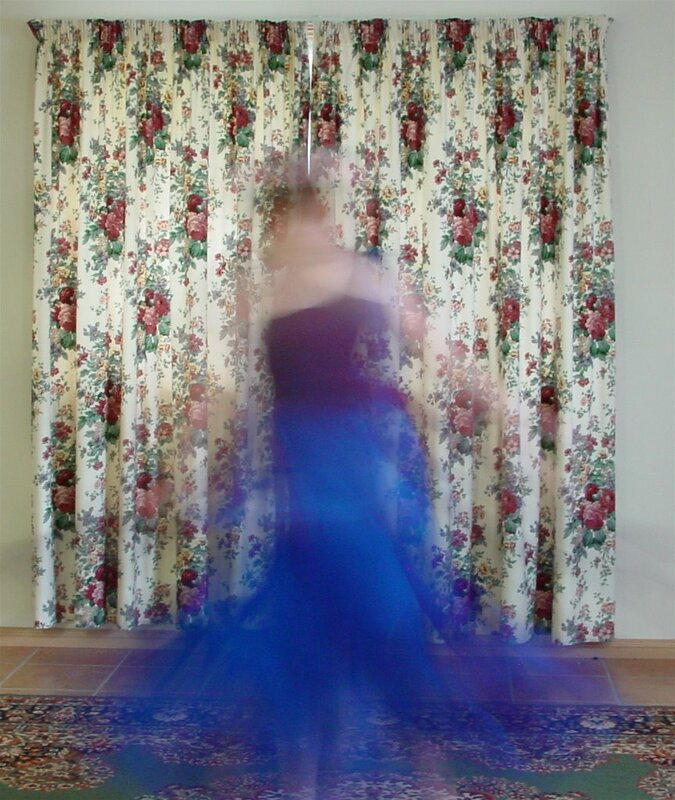 ", Ariel replied (with a cheeky smile), "Spinning dresses." This made a good opportunity to experiment with the camera. We received this dress from some of our US friends - it was a dance school costume with all the skirt cut into strips. Yesterday Ariel finished joining all the strips of the underlying blue material, leaving the outer strips seperated ("Better spinning effect"). This photo is the result. It spins just right! The new film from C.S. Lewis's Narnia Series, "The Lion, The Witch and The Wardrobe" is almost here. This is a link to an interactive map of Narnia. The new video clip is here. The mess that was our last US Hotel stay at the Hampton Inn at Atlanta Airport (see here and here for the tale of woe) has had a partly pleasing resolution. Whilst waiting at San Francisco airport (look in the September archives for all the adventures we had there) I logged on to the Hampton Inn website and lodged my complaint listing all the reasons for my dis-satisfaction in a reasonably long, but polite, email. Two days later I received an email telling me they were sorry and were passing it on. Five days after that was another "Sorry" email. No more contact. Then I checked my Credit Card (online of course) and found that they had credited the cost for both rooms. So the credit was just fulfilling their guarantee - for which I am quite grateful. However, the key to good marketing is to turn any complaining customer into a loyal customer. Further contact would have clinched our future support. Today I learned something very good. The latest versions of iTunes allow you to configure a file to have a bookmark. That is, when you return to an audio file, it will remember where you last were. Audible books already have bookmarking built into their file format. However, we have a number of larger MP3 files which we enjoy. Unfortunately there are times when our place is lost due to someone else using the iPod or the iPod being off for too long. Now when we go back to that song, it will remember where we were. Marvellous! In iTunes highlight the file, right click and select "Get Info". Select the "Options" tab and then just tick "Remember playback position". Easy as that! One of the problems with moving is the time it takes for your body to re-acclimatise to the new air and water. 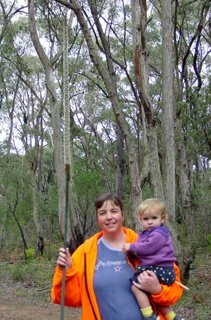 When we moved from the city to the country we were quite sick for the first six months as our bodies were getting used to pollution free air and clean water. Every location has different pollens and other stuff in the air. We then went to the US and were ill for our first winter as we became used to the mould from the millions of decaying leaves and the various pollens and different stuff in the air, as well as the different bacteria and other bits in the water. Once our bodies adjusted we came home. Now Lana is not happy experiencing hayfever and we have all had sore throats. One solution we have for Lana's hay fever is to use an air filter. We close the windows and run the filter. Quickly the air clears and Lana is breathing better. The air filter is designed to clear out cigarette smoke, cooking smoke and odours and the dust in the air. It works quite well. Soon, Spring will be over and Summer will start in earnest. For Lana it isn't quick enough! PS If you are looking for air filters, they are known as "Air Cleaners" or "Air Purifiers". There are lots of options depending on room size and cleaning actions. 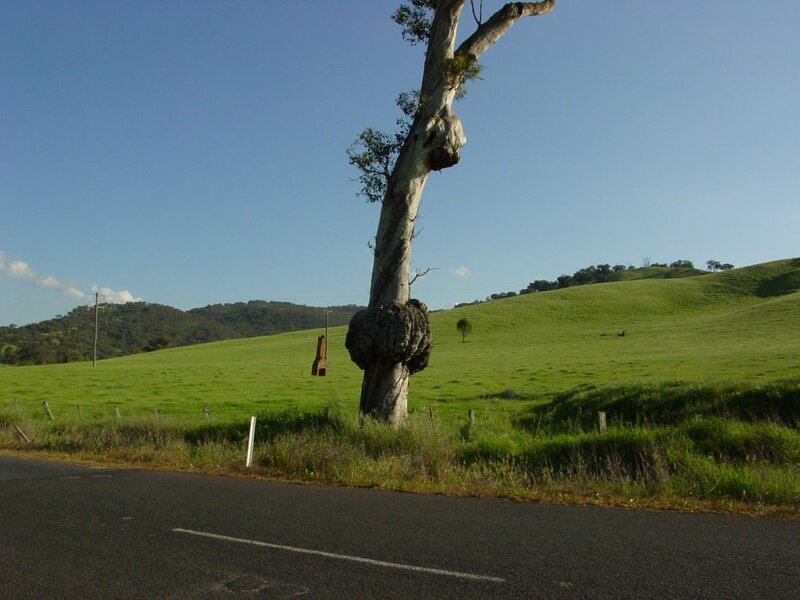 On the winding road between Gundagai and Tumut is this tree. It is an old gum tree clinging to life with enormous growths on its trunk. Behind it stands a brick chimney, all that remains of an old house which has since given way to pastures.